Removing Outlets and Registers – How can we help? Whether you are closing one of your outlets down or a register was added for a popup location, you may decide to delete an outlet or register. Please Note: Your billing is based on the number of registers and outlets your account has, so make sure to delete registers and outlets not being used in your stores, as you will be charged for these. If you want to check your plan and billing information, head to the Billing tab in the Setup menu. Although you may have deleted the outlet or register, you will still be able to use generate reports on the deleted outlet and register. To do this, type in the name of the outlet or register in the filter bar and the date range on the reports you wish to run. Once you have deleted the outlet or register, you will not be able to filter for this outlet or register on the Sales Ledger or Sales History. If you would like to export data for the deleted outlet or register, amend the Date from and Date to sections, on your Sales Ledger or Sales History, to the time before deleting the outlet or register. You will then be able to export data for the outlet and register prior to deletion. To access a sale from the deleted register, please refer to your exported CSV and type in the sale or invoice number on Sales Ledger or Sales History. It is a good practice to keep multiple backups of the data. We recommend, that prior to deleting your outlet or register, that you save the register closure summary as a PDF. This is because the register's closures will be deleted from the register closure reporting page and you will not be able to access this after deletion. You may not be able to delete the outlet or register if the third party integration you have is live. Please speak with the third party themselves to see if you need to unlink the integration from the outlet or register you plan to delete. Before you delete a register, we recommend that you follow the steps below. Navigate to Products > Stock Control. Look for any open/sent orders linked to the outlet you want to delete. Click on the open order. Navigate to Products > Stock Control > Inventory Count > Due. Click on the inventory count for the outlet you plan to delete. A Warning message will pop up informing you about your inventory levels. 3. Close the register. In order to delete an outlet, the register must be closed. 4. Assign user(s) to an outlet you wish to keep except the primary admin which by default will have access to all outlets and cannot be changed. 5. Transfer any inventory from the deleted outlet to the outlet you wish to keep. This is because deleting an outlet will delete any inventory associated with the outlet as well. To learn more about inventory transfer, click here. Important: Deleting an outlet cannot be undone. To delete an outlet, navigate to Setup -> Outlets and Registers and click on the name of the outlet you would like to delete. From here, click the Delete Outlet button in the right-hand corner of the page. 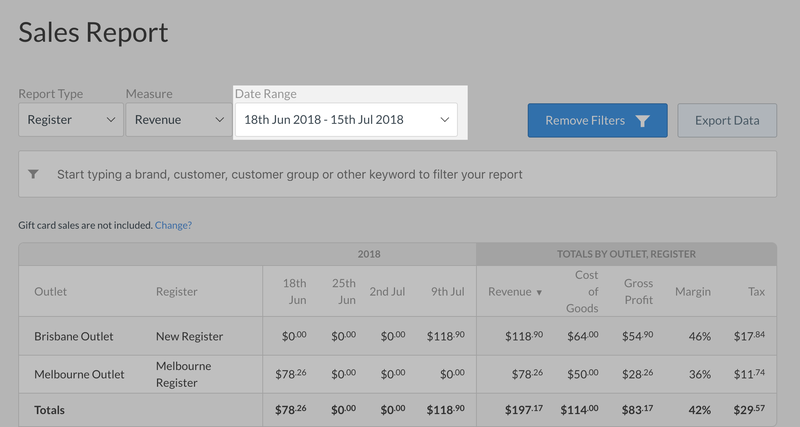 While you'll no longer be able to make sales using this register, you will still be able to report on all the past sales data attached to this register. Navigate to the Sales Ledger. Look for any open sales such as; parked, layby, or on account sales. Expand each of these open sales and select Void. Make sure you are on the outlet associated with the register you want to delete. Close the register by navigating to your Sell Screen -> Open/Close > Close the register. Please Note: Deleting the last register associated with an outlet will delete the outlet as well. Important: Deleting a register cannot be undone. To delete a register, navigate to Setup -> Outlets and Registers and click on the name of the register you would like to remove. From here, click the Delete Register button in the right-hand corner of the page. If you receive a message like this, you will need to make sure that there are no open sales on the register. To check this, follow these steps.